Dr. Elizabeth Williams grew up in Clay, located in central New York and went to veterinary school at the University of Illinois in Champaign-Urbana. After graduation in 2006, she completed a rotating small animal internship at a 24 hour emergency and specialty hospital in Rochester, NY. Following her internship she moved to the Maryland/DC area to work as an emergency veterinarian for five years, before deciding that she had had enough of the cold weather. 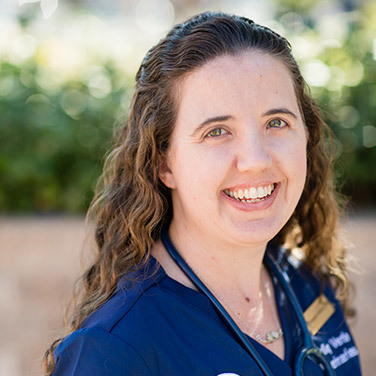 She then moved west and continued working as an emergency veterinarian at a specialty and emergency hospital in Tucson for another three years. Dr. Williams joined the team at Valley Verde Veterinarians in 2015, where she has enjoyed getting to know her clients and patients. She looks forward to many more years of working with her patients and their families. Dr. Williams lives with her boyfriend and their dog, Mortimer Brewster (Mortie for short). In her free time, she enjoys exploring the West with her family, wine tasting, cooking, and not having to shovel snow.